I’m pretty happy with this review from NOW’s Jon Kaplan with its very kind shoutout for my arrangement of Dido and Aeneas! The most unusual show we saw was Dido And Aeneas: 21st Century Remix, in which music director Gregory Oh took Purcell’s short 1680s opera and blended the original orchestrations with more contemporary musical styles. The period sections stood quite comfortably alongside the modern percussion, bluegrass, Irish reels, Cape Breton fiddling and more, with Andrea Ludwig a poignant Dido (her lament at the end was mesmerizing), jazz singer Alex Samaras a firm Aeneas and Suba Sankaran a nastily wicked sorceress, singing her melodies with classic South Asian musical intonations. Hailey Gillis shone in a bluesy solo composed by John Millard, who also added some mean banjo playing to the show. Like previous Global Cabaret workshops such as (re)Birth: E.E. Cummings In Song and Spoon River, which were then developed into full-length productions, Dido And Aeneas is the kind of bracing, entertaining work that deserves a larger audience and a longer run. Read about the performance as well as the entire festival in the Edmonton Journal! I just premiered a new concerto by Aaron Gervais – for Mozart Piano Videos – with the Group of 27 Orchestra. 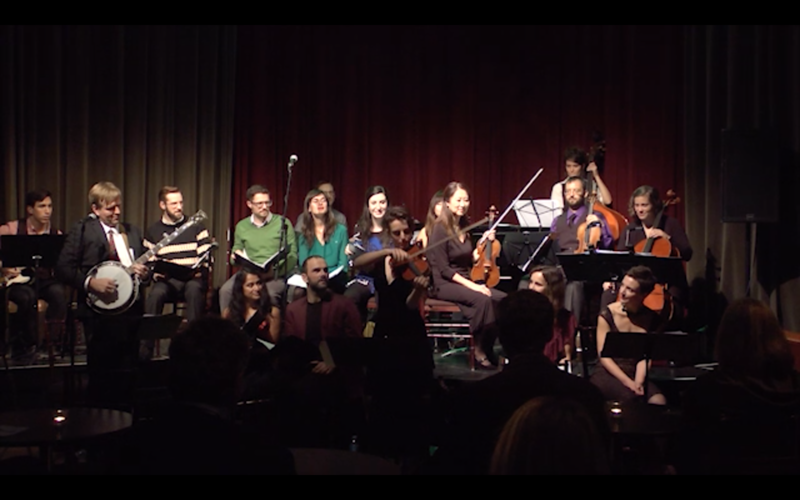 Hard to describe, but essentially a complex, layered triggering of various snippets of creative commons-licensed videos of piānists playing Mozart on YouTube with a chamber orchestra. Here’s a review from NOW Magazine. Incidentally, I am henceforth advancing the modified spelling of “piānist”. The alternative, in this age of swallowed terminal consonants, is somewhat…unpalatable. New Business Venture: Metronome Rental! Dreaming of performing Gyorgy Ligeti’s Poeme Symphonique in Canada or the US but bummed about Wittner’s rental cost (1000 euro plus about 1500 euro shipping to Canada)? Check out the metronome rental link, and make your dreams a reality!